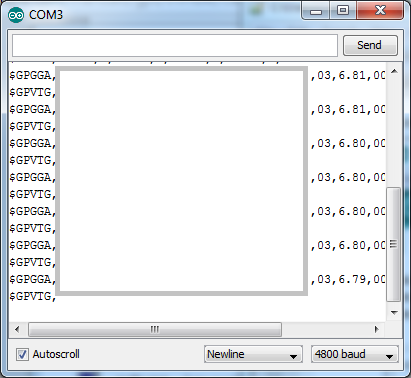 That’s right, I’m receiving GPS data in NMEA format strings, and I was able to get a lock. The next step with the GPS component is to write a simple parser to parse out these values so that they can be bundled into APRS packets and transmitted back to ground. Thus far my understanding of ARPS over the air works something like this. 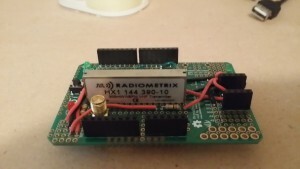 APRS packets are encoded using an AX.25 modulator and transmitted at 1200 baud. The details of this I’ll go into in a later post, but for right now what we need to know is that in order to transmit APRS data, we need to present an audio signal to the radio in the form of a sine wave (AFSK Audio Frequency Shift Keying). Essentially, I’ll need to generate audio frequencies of 1200Hz and 2200Hz (the binary 1’s and 0’s of the ARPS data) and put that onto the HX1 data pin. Great! Sine wave based tones from the device, which I’ll examine later on the oscilloscope as I begin tuning this code to my needs. Well, that’s it for this progress update. I’m going to be out of town for the best part of the next three days, so I guess I’ll get back to this project next weekend.